One morning, C was out in the backyard doing the weeding while I was, as usual, surfing the net. 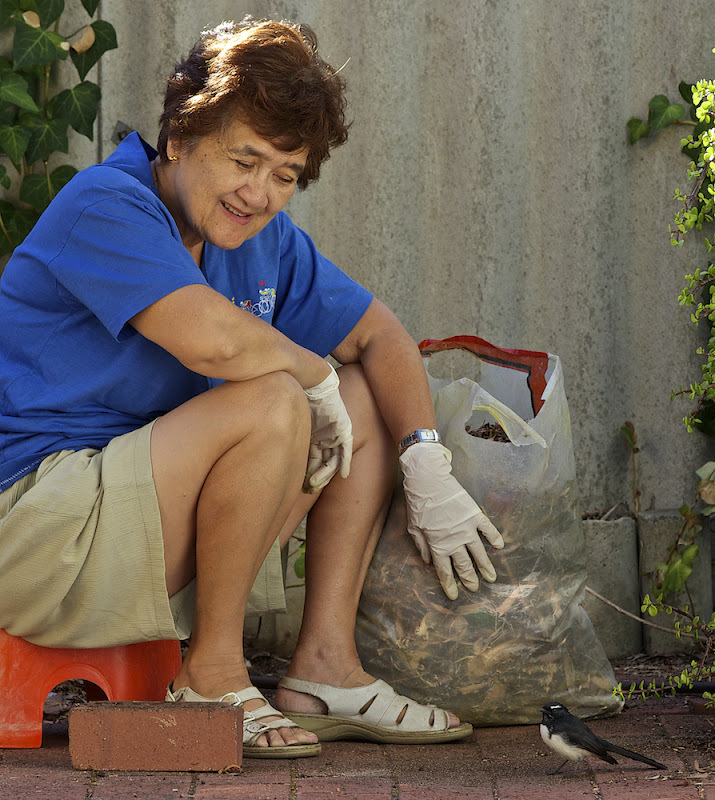 She rang me from her mobile saying that she had a very friendly willy wagtail keeping her company for the last 15 minutes. I put on my long lens and came out to take pictures of it. 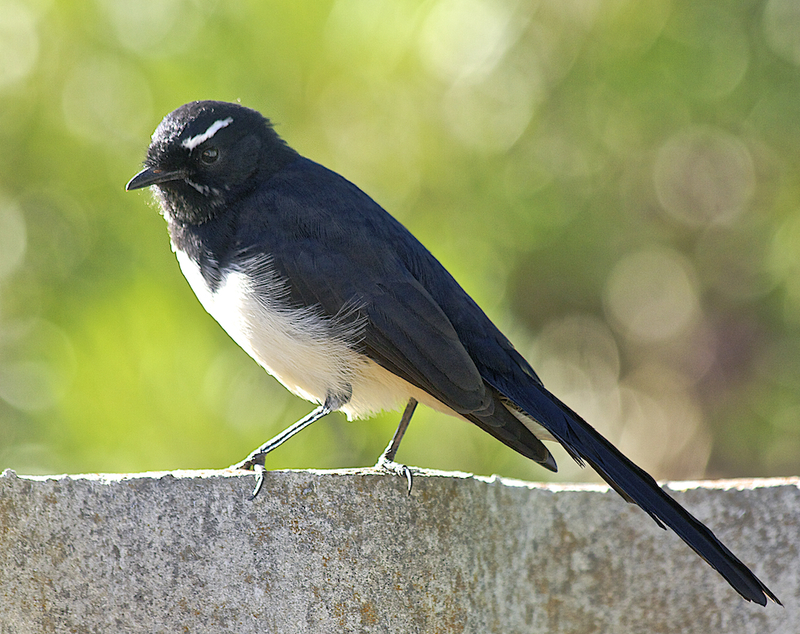 It's called "wagtail" because it moves its tail from side to side. A characteristic is its white eyebrows, as seen in this photo. After posing for several pics, it finally hopped onto the fence and flew away. It's not always so friendly, though. 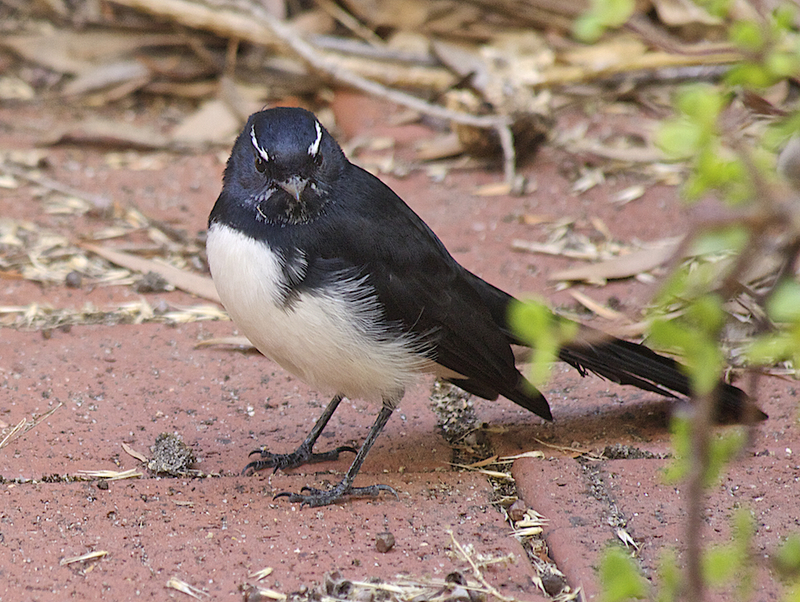 It is very territorial, and I've seen it harass and chase away a much larger kookaburra from my yard. It is also very aggressive in the nesting season in springtime. 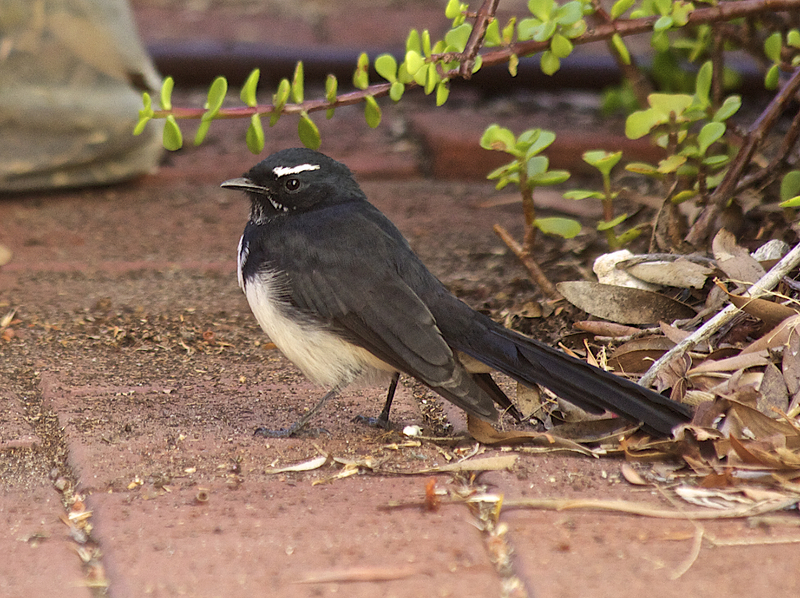 This 2005 video shows the wagtails attacking a young Flemington. Some other feathered backyard visitors are pictured below. 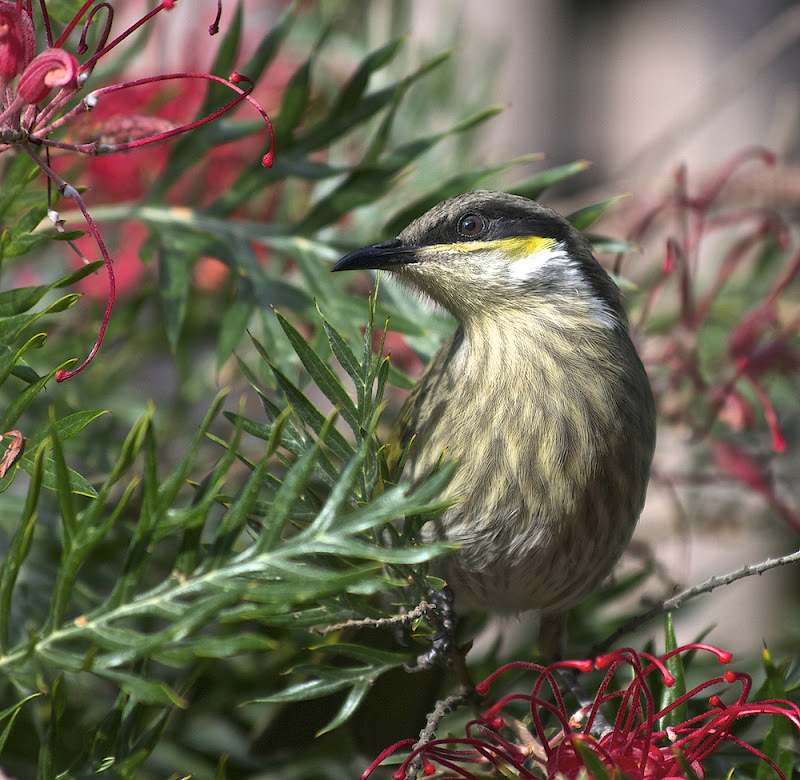 The honeyeater comes to feed on the grevillea. 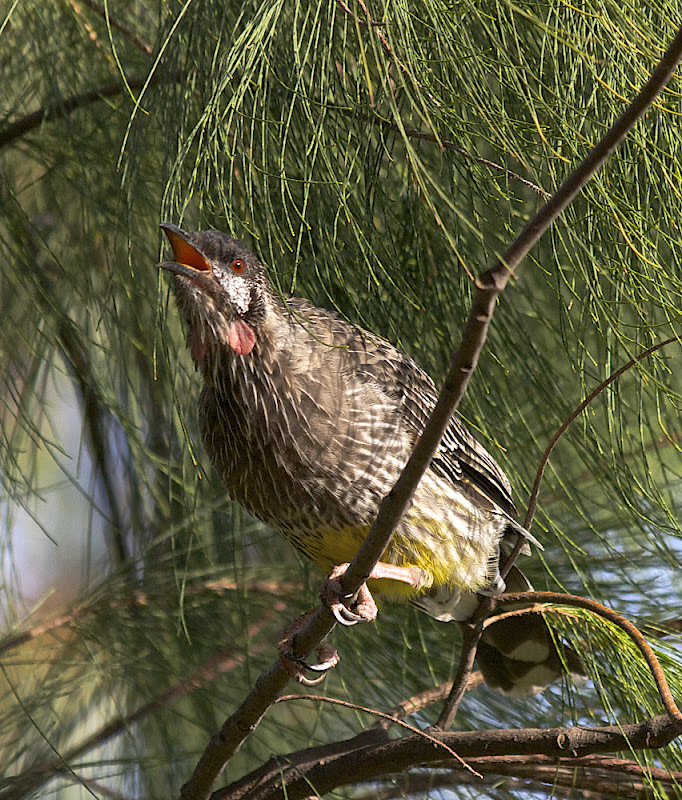 The aggressive wattle bird chases all other birds away from the grevillea and attacks C if she weeds near this bush. 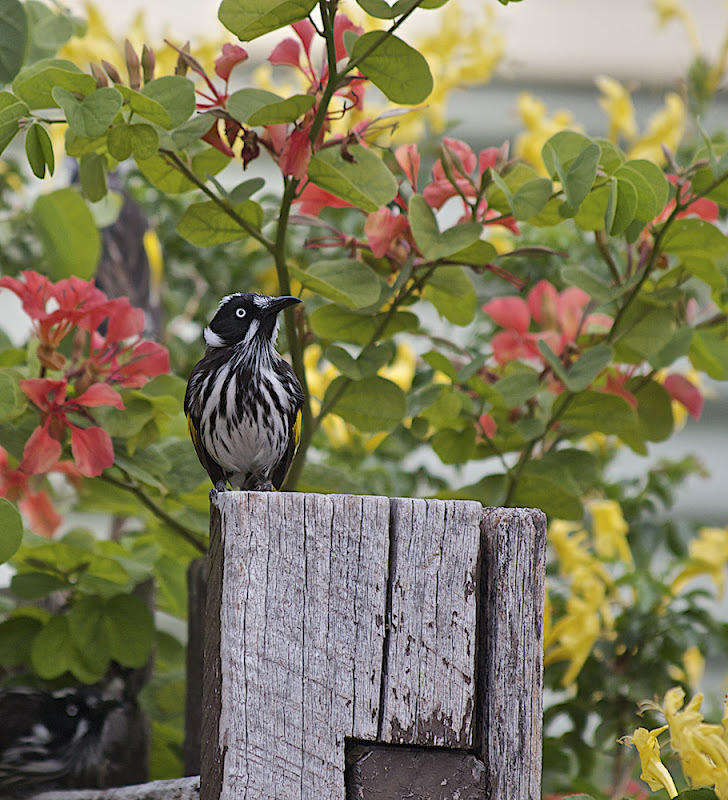 The New Holland Honeyeater come in a big group and make a racket. 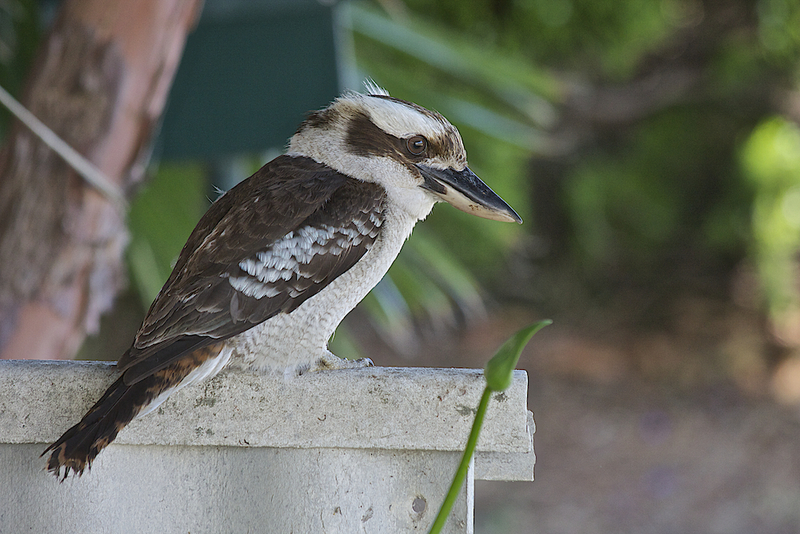 This is the kookaburra that is bullied by the wagtail. 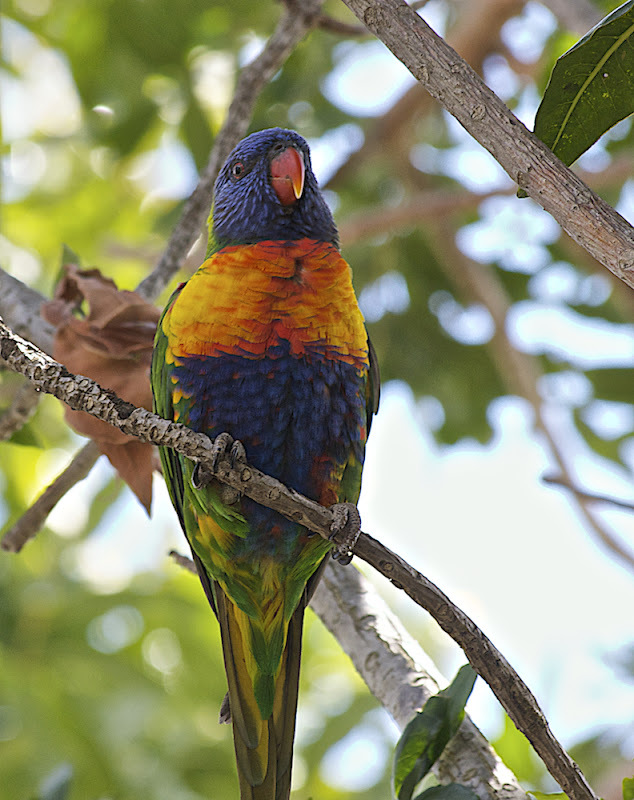 The Rainbow Lorikeet comes less often. 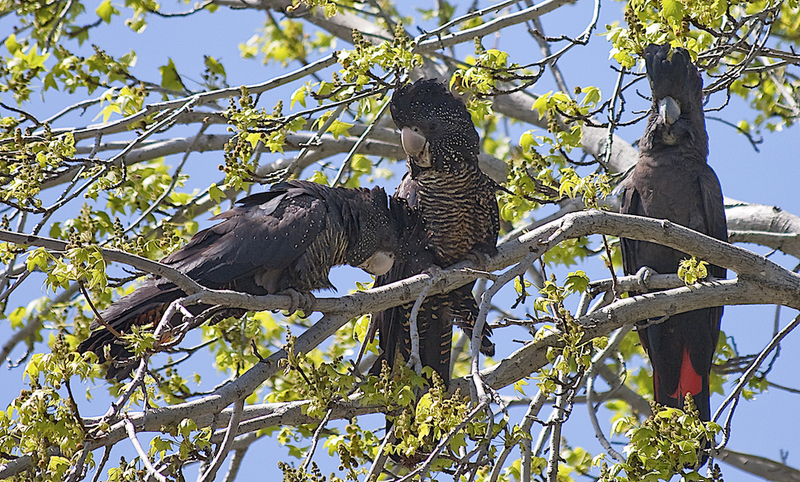 And finally the most exotic visitor, the endangered Red Tailed Black Cockatoo, which comes once or twice a year. I used to think their numbers were increasing when it started coming into the suburbs. However, it appears that they have to come to the suburbs to search for food as they have suffered much loss of their natural habitat. 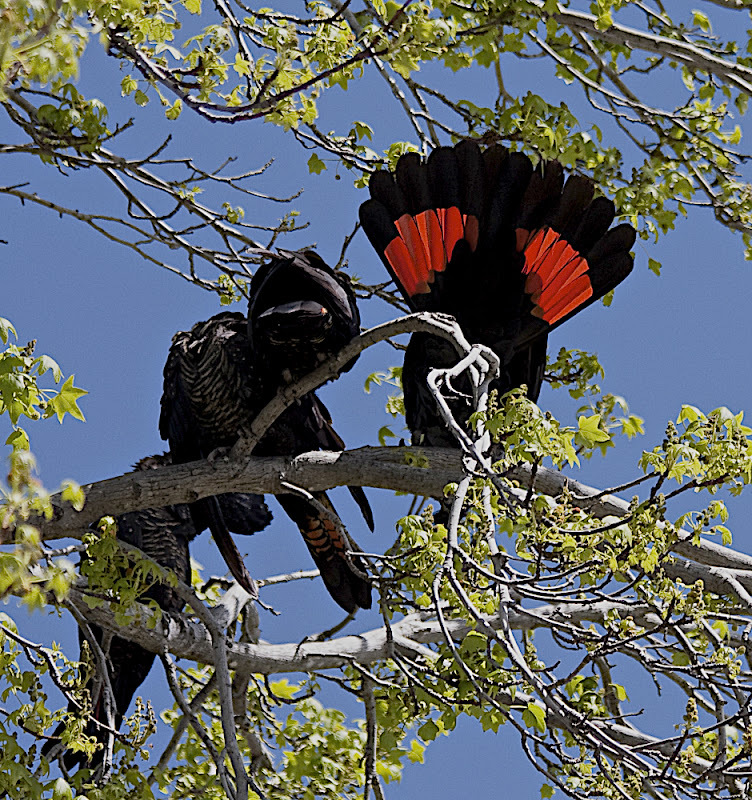 These photos of them sitting in my neighbour's tree show the black male with its solid red tail and the speckled females with their black and red tails. Wowwww!!!! Some of them are really nice. I've got all kinds of birds in my garden, so many of them. Can't snap nice close up shots of them, of course, with my digicam. They are so used people that one can go real close before they fly away. I've an egret too!!! Thanks for the comment. I did check out your egret. Birds seem to have feelings like humans. I've seen a crow get electrocuted on an electricity pole and its friends flew down to circle the body and caw loudly for a long time.